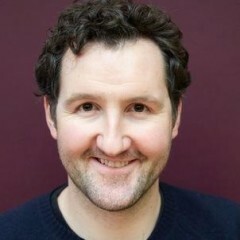 John Hollingworth is a writer for stage and screen. His first full-length play, MULTITUDES, played at the Tricycle Theatre in February/March 2015 under the direction of the theatre’s Artistic Director, Indhu Rubasingham. He was subsequently awarded attachments to the National Theatre Studio and the West Yorkshire Playhouse. He has recently been working with Out of Joint on a new version of Andrea Dunbar’s RITA SUE AND BOB TOO, which toured nationally in 2017 and 2018, including a run at the Royal Court, and will tour again in 2019. Last year John was commissioned by Paines Plough to write a play about Otley as part of their COME TO WHERE I’M FROM season, and he performed a new piece of his at West Yorkshire Playhouse’s ‘Furnace’ New Writing Initiative. John has also staged work at the Soho Theatre, the Arcola and Tristan Bates Theatre. He is a graduate of Trinity College Dublin. As an actor John is represented at Conway Van Gelder Grant.